Sen. Jeff Sessions was one of Congress’ leading crusaders for cracking down on illegal immigration and increasing mass deportations – positions he could turn into a reality as attorney general. If President-elect Donald Trump officially choose Sessions to lead the Justice Department, immigration could be the top priority of his administration, the Associated Press reports. As the nation’s top law enforcement official, Sessions could execute maneuvers to limit which nationalities the U.S. would accept as refugees and to reverse a federal policy that protects young people from deportation. “The president has the clear power to suspend immigration to protect America,” Sessions said during the Republican convention when he was discussing the threat of terrorism and the need to scrutinize refugees more closely. The fourth-term Republican from Alabama was the first senator to support Trump’s candidacy, and he helped shape Trump’s positions on immigration. 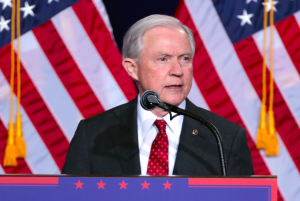 Sessions favors limiting the number of refugees coming into the U.S. and turning away children who arrive at the border alone who are attempting to reunite with families living in the U.S.
Posted: 11/22/16 at 9:39 AM under News Story.